For other uses, see Granulosa cells. Follicular cells (also called thyroid epithelial cells or thyrocytes) are cells in the thyroid gland that are responsible for the production and secretion of thyroid hormones thyroxine (T4) and triiodothyronine (T3). They are simple cuboidal epithelium and are arranged in spherical follicles surrounding colloid. 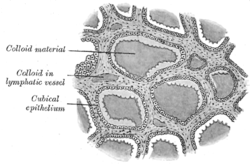 The interiors of one of these follicles is known as the follicular lumen. They have thyrotropin receptors on their surface, which respond to thyroid-stimulating hormone. Calcitonin-producing parafollicular cells (C cells) can be found scattered along the basement membrane of the thyroid epithelium. Their embryologic origin is from a median endodermal mass in the region of the tongue (foramen cecum) in contrast to the parafollicular (C) cells that arise from the 4th pharyngeal pouch. The thyroid epithelial cells take up iodine and amino acids from the blood circulation on the basolateral side, synthesize thyroglobulin and thyroperoxidase from amino acids and secrete these into the thyroid follicles together with iodine. 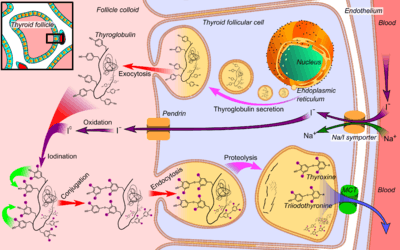 The thyroid epithelial cells can subsequently take up iodinated thyroglobulin from the follicles by endocytosis, extract thyroid hormones from it with the help of proteases and subsequently release thyroid hormones to the blood. These thyroid hormones are transported throughout the body where they control metabolism (which is the conversion of oxygen and carbohydrates to energy). Every cell in the body depends upon thyroid hormones for regulation of their metabolism. The normal thyroid gland produces about 80% T4 and about 20% T3, however, T3 is about four times as potent as T4. Iodine is taken up on the basolateral side of the thyroid epithelial cells by sodium-iodide symporters. It is secreted into the follicle through the chloride/iodide transporter pendrin on the apical side. ↑ Walter F., PhD. Boron (2003). Medical Physiology: A Cellular And Molecular Approaoch. Elsevier/Saunders. p. 1300. ISBN 1-4160-2328-3. ↑ Levy, O; Dai, G; Riedel, C; Ginter, CS; Paul, EM; Lebowitz, AN; Carrasco, N (27 May 1997). "Characterization of the thyroid Na+/I- symporter with an anti-COOH terminus antibody.". Proceedings of the National Academy of Sciences of the United States of America. 94 (11): 5568–5573. doi:10.1073/pnas.94.11.5568. PMC 20819 . PMID 9159113.